Talks between India and Pakistan in August this year were cancelled at the last moment after the then Pakistan National Security Advisor Sartaj Aziz expressed his desire to meet Kashmiri separatists during his visit to New Delhi. But India had maintained that it was willing to discuss "terrorism-related issues" and nothing else. The blame game for the cancellation of talks continued for many days. India took a tough stand and asked Pakistan to control cross- border terrorism as a precursor to dialogue. 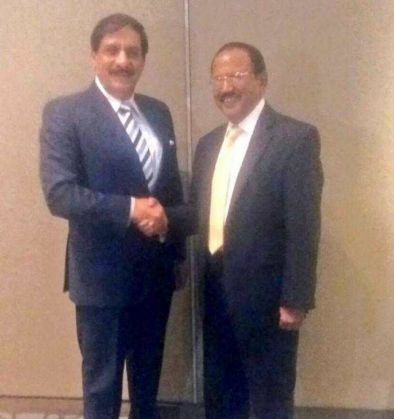 The National Security Advisors of India and Pakistan met in Bangkok on 6 December. A number of issues, including the problem of cross-border terrorism, were discussed at the meeting which was kept rather hushed. Ironically just a few days before the meeting, Indian media splashed reports warning of a possible attack by Lashkar-e-Taiba. According to reports, the LeT is helping militants target Prime Minister Narendra Modi's gatherings and is planning to assassinate other high-profile politicians in Delhi. Congress has termed the secret meeting of National Security Advisors in Bangkok as a "grand betrayal" of the Modi government and a reflection of "flip-flops" over its Pakistan policy. "It's a grand betrayal. It's a betrayal of everything that this government has ostensibly, publicly espoused," Congress leader Manish Tiwari told PTI. "If you look at the track record of this government over the past 18 months, their Pakistan policy has been an extravaganza, a summersault, flip-flops and 180-degree U-turns and this is absolutely the crowning glory," he said. Some experts also believe that nothing much has changed for India to change the position now. "India gains nothing and only makes a mockery of itself for its diplomatic failure. On the other hand Pakistan and ISI can claim that they have applied pressure on India to agree for talks," Sushant Sareen, Senior Fellow, Vivekananda International Foundation, told Catch. According to Sareen, this is a huge diplomatic failure for India if Modi government has succumbed to pressure from western countries. "ISI role in augmenting terror activities in India is an open secret. India should have easily convinced western countries to put pressure on Pakistan to behave. But in the present scenario, there has not been a noticeable change in Pakistan's approach but India has made an about turn," Sareen added. Some experts believe that Modi is laying the ground work for his visit to Pakistan for the South Asian Association of Regional Cooperation summit in 2016. Foreign minister Sushma Swaraj is expected to visit Islamabad on 8 December. She will be accompanied by foreign secretary S Jaishankar. The Modi government needs to now explain this change of heart.